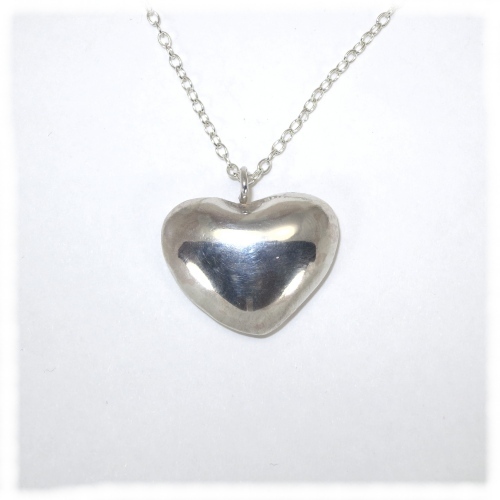 A sterling silver single thickness heart pendant with a bright polished finish. The heart is 25 by 20 mm and weighs about two grams. The standard options for chains are a 40 cm or 45 cm trace chain. More variants elsewhere on this page. 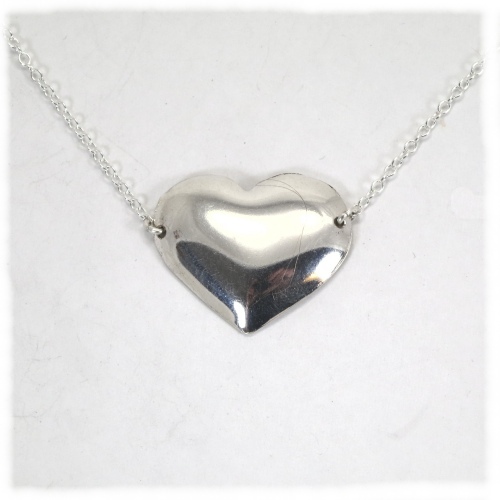 A sterling silver single thickness heart pendant with a bright polished finish with a different chain arrangement to that above. The heart is 25 by 20 mm and weighs about two grams. This has a 40 cm trace chain. More variants elsewhere on this page. 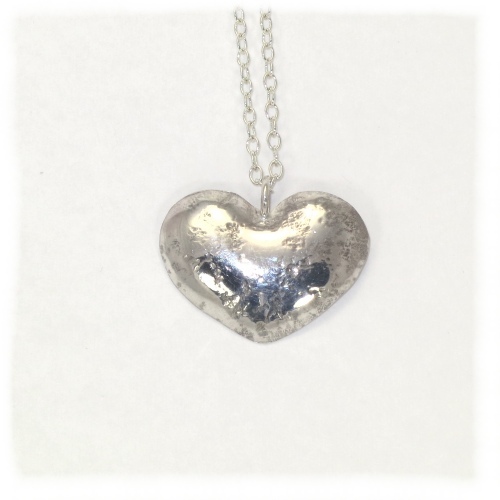 A sterling silver single thickness heart pendant with a bright embossed finish. The heart is 25 by 20 mm and weighs about two grams. The standard options for chains are a 40 cm or 45 cm trace chain. More variants elsewhere on this page. A sterling silver double sided heart pendant with a bright shiny finish - bows out on both sides rather than the ones above that are more like a shell. The heart is 25 by 20 mm and weighs about 5 grams. The standard options for chains are a 40 cm or 45 cm trace chain. More variants elsewhere on this page. 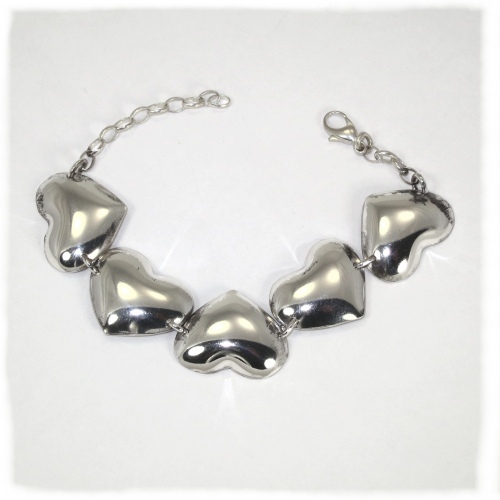 A bracelet using the same basic heart unit as other items on the page.It consistes of five alternating hearts with a heavy anchor style chain which allows the tightness of the bracelet to be easily adjusted. It weighs 14 grams. 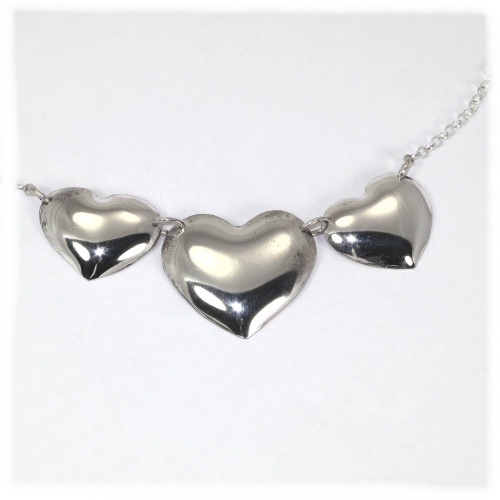 A sterling silver three heart pendant. The smaller hearts are 25 by 20 mm and the larger 30 by 27 mm. It weighs 16 grams. The length is adjustable by moving the clasp up and down the opposite chain. 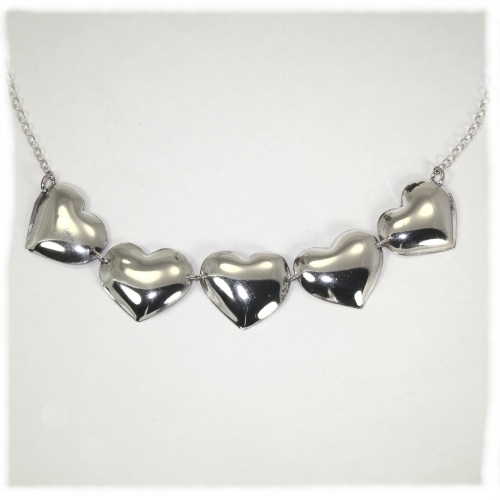 Five silver hearts form the centrepiece of this necklet. 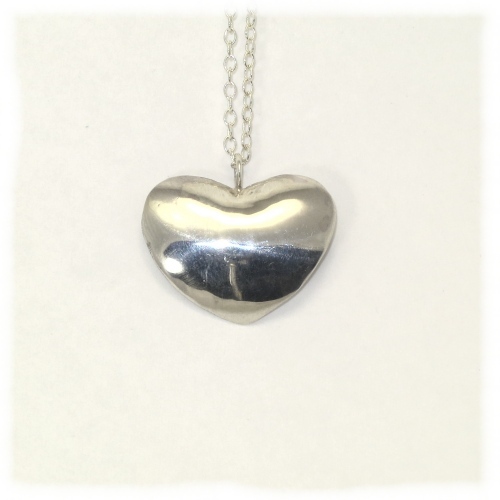 The hearts are 25 by 20 mm and the necklace weighs 16 grams. The length is adjustable by moving the clasp up and down the opposite chain. 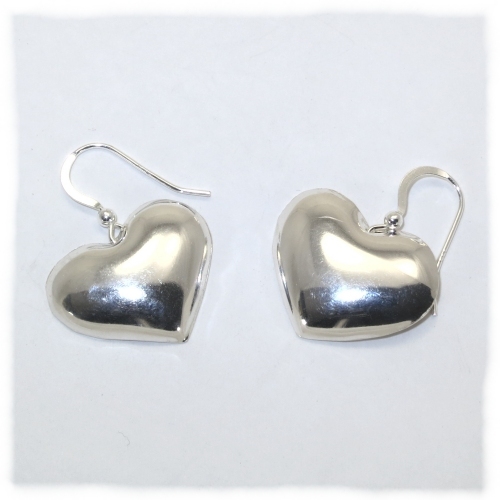 Shiny sterling silver heart shaped earrings. The hearts are 25 by 20 mm and the pair weigh 2 grams.